Pecorino is the family name of a hard Italian cheese that is made from Ewe's milk. The word derives from pecora, meaning "sheep". The milk can be raw or pasteurized when it is combined with starter bacteria and rennet. After the curd is broken into granules it is extracted and placed into molds for the excess buttermilk to be released. Then the cheese is flipped many times. Finally, salting is done as it is a traditional form of curing, or a brine may be used. In total, the process can last up to 8 hours for a soft cheese and 12-14 hours for a hard cheese. The soft cheese matures for 20 days in a climate controlled room, while the mature cheese requires 4 months. The Lunigiana Pecorino cheese has notable characteristics of an intense yellow colored rind and soft texture. The color of the inside is a white-straw yellow in soft Pecorino cheese and straw yellow in hard Pecorino cheese. It is produced through 20-25 minutes of milk coagulation at a temperature between 95° and 100°F. After coagulation, a calf rennet must be added. If a soft cheese is desired, the curds are broken up into lumps the size of hazelnuts. If a semi-hard cheese is sought-after, the curds are broken up to the size of corn kernels.The maturation process for both types takes about 60 days. This fresh cheese has been made using the same traditional practices that Lunigiana farmers have used for centuries. The only ingredients for this product include: cow's milk, salt, rennet and milk ferments. It doesn't contain preservatives, gluten or other additives. It is a soft, sweet cheese with a strong milky flavor. This dairy product does not have a crust, but still holds a compact shape. Often this cheese is white and has a simple aroma. Traditionally, during the production process this cheese would be removed from the cauldron and placed on beech twigs or woven hornbeam, which would give it a special yet simple aroma. But modern techniques no longer follow these traditional practices and instead after the Ricotta is removed from the cauldron it is placed in containers to cool. Regardless, once the cheese is cool, it is ready for consumption. Still produced according to ancient traditions, this fresh cheese does not have a crust and the outer surface is soft and white in color. The inside texture is soft as well and does not have holes. The mature cheese has a straw-colored rind, while the rind on a semi-hard cheese is typically light brown or pale yellow. This cheese pairs well with honey and red or white wines with a low alcohol content. Ricotta is an Italian whey cheese made from sheep, cow, goat, or Italian water buffalo milk. In the production of Ricotta, the whey that was removed during the making of Parmigiano Reggiano cheese is also used. Like other whey cheeses, it is made by coagulating the proteins that remain after the casein has been used to make cheese. This product is a hard cheese, that has been cooked slowly. The cheese is produced from the milk that was skimmed from the previous night, mixed with the whole milk of the morning, along with the addition of salt. According to tradition, additives are forbidden. The minimum aging of a wheel is 12 months. The cheese has a distinctive fragrance with a nutty and delicate flavor. 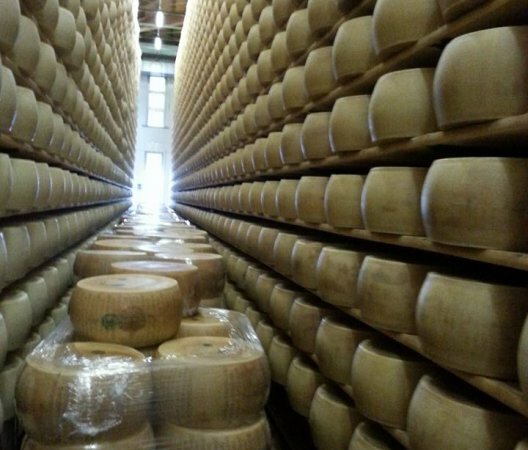 Visit the Parma region's cheese factories, taste the cheese, and you will know why it is the world standard for Parmesan cheese! 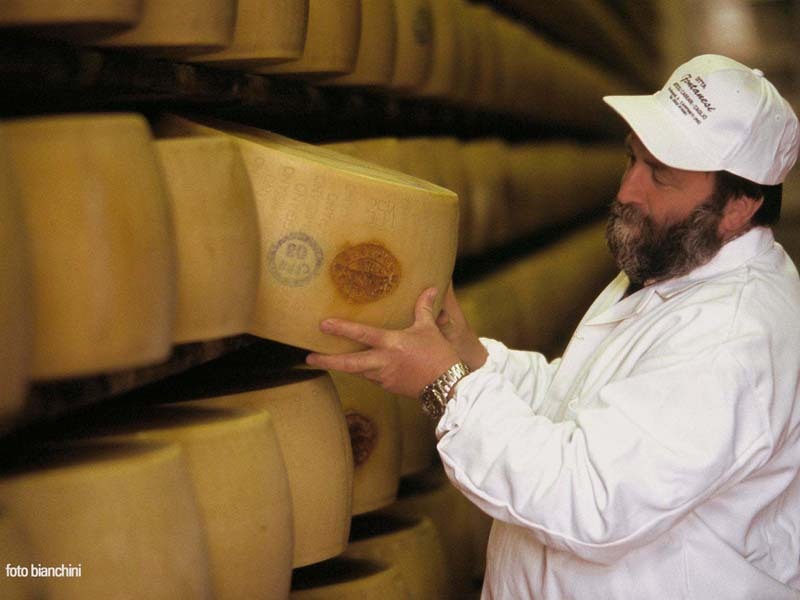 Produced in the mountains of Reggio Emilia, this cheese is made from whole sheep's milk during the spring and summer. After warming up the milk in traditional boilers, coagulation occurs when rennet is added. The curd is then broken up, cut into portions and placed in wooden molds. After 60 days of ripening, the cheese is light, compact and free of holes. The size varies from 2 to 5 pounds and the pecorino cheese is distinguished from Tuscany because it has a sweeter taste and is less salty. On the rind of the Pecorino cheese there are not any anti-fermentative used. The Semitenero of Loiano is a fresh cheese that does not require aging. It is made from whole cow's milk and the production area is restricted to the Tuscan-Emilian Apennine region. The milk is pasteurized at 38° F and then rennet is added. The curd is then broken to the size of grapes and allowed to rest. The curd is transferred to molds and is not compressed like Parmigiano or Pecorino. The next step is the salting process, which is done in a brine bath for 8 hours and then transferred to cold storage for another 8 hours. Semitenero Loiano has a yellowish crust and is creamy with a sweet and slightly acidic taste.